Give your deck or porch a stately appearance without sacrificing the charm and comfort you want for your outdoor living space. You can have it all with the POLYWOOD® Presidential Woven Rocker 3-Piece Set. Give your deck or porch a stately appearance without sacrificing the charm and comfort you want for your outdoor living space. You can have it all with the POLYWOOD® Presidential Woven Rocker 3-Piece Set. This attractive set includes two Presidential Woven Rockers and a Two Shelf Side Table. It's available in durable mahogany POLYWOOD all weather recycled lumber and the chairs are accented with a woven seat and back in Tigerwood. This low-maintenance set cleans easily with soap and water as it resists stains from wine and condiments, corrosive substances, salt spray and other environmental stresses. 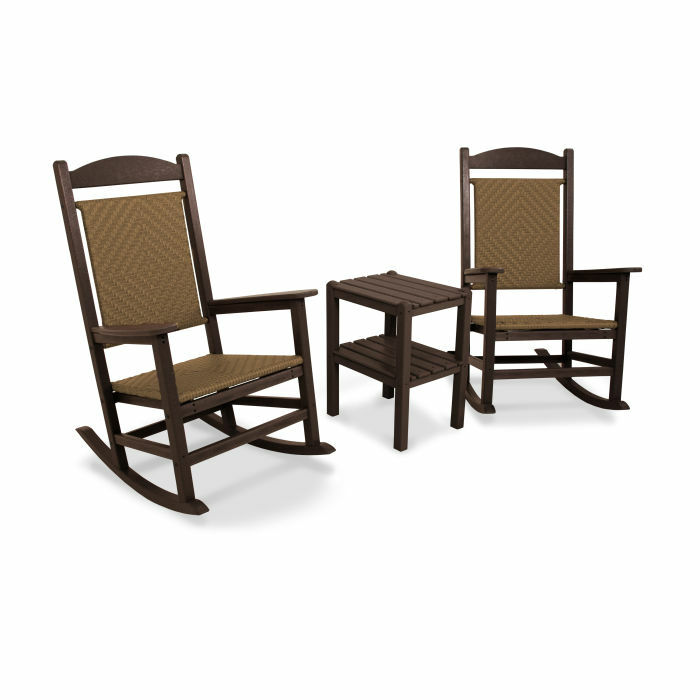 It's also sturdy enough to withstand nature's elements so go ahead and relax, this rocker set will last and look good for years to come.